Where can I play online poker for free? - Casino Answers! Casino Answers » Poker » Online Poker Beginner Q&A » Where can I play online poker for free? 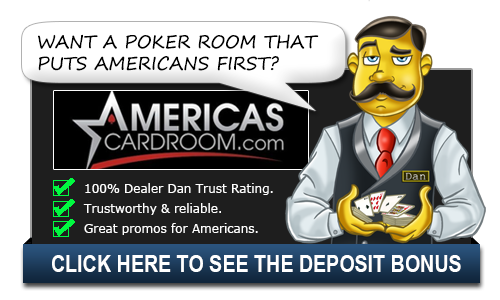 Every poker room offer both real money and play money options for players. You simply download the software and choose either the real money tables where you can actually bet for real money, or the play money tables where you are given a play money balance, or play money chips, and then you can play online poker for free without risking any of your own money. You can even play for free, with the chance at winning real money. Not in cash games but in something called “freeroll tournaments”. You play in a freeroll tournament where it costs you no money to enter, and you have the chance at winning real money which you can then cash out, or start building a bankroll with by playing for real money. There are many different apps and websites that let you play poker for free. These poker games are sponsored by the World Series of Poker or ESPN and can feature a ton of players. That said, we don’t recommend using these. So often in these games you see things that you would never see in live poker. Hands where all the players at the table pay the blind, hands where people call every raise no matter what – even when they are drawing dead. That’s because these people simply don’t care. This is fake money and they just want to see the action. They want to pay to see what you have because they know it’s not real money. Bluffing just doesn’t work in these games and it’s better to go with a poker room. That’s why we recommend using a poker room to play for free. Every poker room will allow you to sign up without making a deposit and then play in their freeroll tournament. You can do this across multiple sites as each site has a unique tournament schedule so you can play multiples. While you might not make a lot of money playing these, you can gain some valuable experience playing in a tournament setting against players who actually care about what happens. These games work great to show you what the tournament experience is like as once you get near the money cutline, the play is just competitive as it would be in a tournament with more money at stake. This is a great way to get started and see how you like it. We should note that these freeroll tournaments tend to have a small prize pool and a large amount of players to play against, so even if you win the tournament after many hours you may have only averaged $2 an hour. However freeroll tournaments are a great way to get started in poker, and learn a lot more about the game. If you are looking to play in freeroll tournaments or play for play money, the best poker room for this is Pokerstars who have some great freerolls, and a wide variety of games for play money players.